Your own personal off-grid, wired telephone system. • Uses normal off-the-shelf wired telephones. • Provides wired communication between fixed shelters, such as homes, barns or sheds. • Operates from and charges an 18650 lithium iron phosphate (LiFePO4) battery, allowing operation during limited power outages. • Accepts charging voltages between 6v to 30v, allowing a wide variety of power inputs, including wall adapters, car or truck batteries or direct solar panel inputs. See manual for FCC-compliant externally-powered configurations and tips for those wishing to experiment with additional homebuilt or mobile configurations. • Reverse input power protection. • Two separate phone circuits which can be conferenced with a two-line master telephone or bridged locally. • Silent LED call indicator, or optional quiet piezo call indication. • Remote phones support call indication via a separate ring interface module. • Flexible integration of future ring interface and handset options. • 3.5 mm audio connector for monitoring system use or recording calls for training purposes. • Flexible extension to future remote station options including advanced headsets, sensor and actuators, and data terminal devices. • Line protection against transients. • Saves military fieldphone sets for actual field use. We also offer bundles of units with popular combinations of system components. 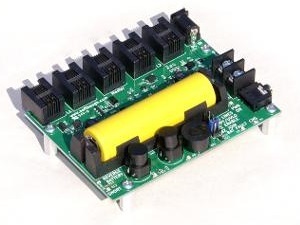 • Field Phone Host Module, $79 each, includes 18650 LiFePO4 battery, SB6VF power adapter, EMI ferrites and capacitor. • Field Phone Ring Interface Module, $12 each. • Spare 18650 LiFePO4 Battery, $8 each. Be sure to check out our Field Phone Forum and get involved in the discussion and direction of this project and future peripheral devices. For all our Kickstarter backers and bloggers who posted about this project, even though the project ultimately wasn't funded, check out special offers for our backers. Thanks to each of you! Disclaimer: the field phone system is for hobbyist use and is intended for educational purposes. Some system components use high voltages or supply fixed currents and could present a hazard if wet, as does any telephone line. Use at your own risk and ensure that children operate the system only with adult supervision. Do not lick or ingest any system component. Zombies may become entangled in wiring and present a hazard to the operator. Our development staff now includes Amateur Extra radio FCC licensees, increasing the breadth of our existing wireless development services. © 2001 - 2016 SoftBaugh, Inc. All rights reserved.